Charles Dickson was born in County Down and was educated in Belfast, where he became a medical practitioner. 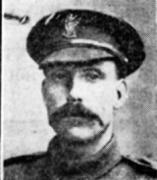 He was a civil servant and in France and Belgium served in the Royal Army Medical Corps in the First World War. From 1962 to 1970 he edited the Irish Journal of Medical Science. He published The Life of Michael Dwyer; The Wexford Rising in 1798 and Revolt in the North and was an authority on late 18th-century Ireland.